Valve's awarding winning puzzle game would only benefit from glasses free 3D. Yesterday, we published an article mentioning five video game franchises that would look sweet on 3DS, such classics as After Burner, F-Zero and Outrun. 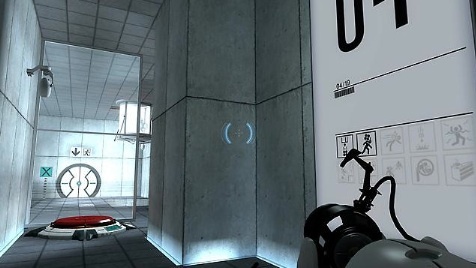 This prompted one of our readers to suggest Portal, Valve's award winning title. The more we thought about that, the more it made perfect sense. Great Scott, why not Portal? 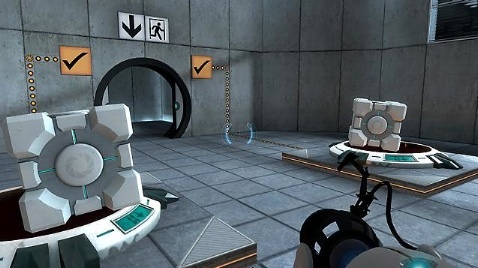 Originally released as part of the stellar The Orange Box in 2007, Portal is a first person puzzle game that challenges players to move a test subject named Chell from one side of a level to the other, using a device that creates portals to walk through. In one portal, out the other. You do this to avoid pits, obstructions and even gun turrets, all while a crazed artificial intelligence called GLaDOS (Genetic Lifeform and Disk Operative System) comments on your current situation. The game was a huge hit, eventually spawning a sequel, Portal 2, that released earlier this year. Why would Portal work so well on 3DS? For starters, there's glasses free 3D to consider. Valve could pull off some cool special effects with the tech, adding increased depth to the experience. What's more, it would be an excellent game to pair with Nintendo's upcoming Circle Pad Pro, the peripheral that adds a second circle pad to 3DS. That way, players would have no trouble navigating the 3D environment, though we imagine Valve would be able to map second analog functionality to the touch screen. From there, players would merely fire the portal gun with the right shoulder button. On top of that, the publisher could make use of the system's online features to release additional levels or maybe implement a custom level editor for players to share stages. There's even potential for StreetPass functionality in wirelessly exchanging data with other gamers, perhaps best times. As for technical limitations, we have faith in Valve to shoehorn the console/PC version onto the handheld with minor sacrifices. Granted, Portal is more than four years old, so the thought of receiving a port of such an old game may not thrill you. At the same time, we think both it and its sequel would find proper homes on Nintendo's 3DS, and it would be cool playing these games on the go.